The Dia-Sharp® Magna-Disc™ System is designed to work with Work Sharp™ Models WS2000 and WS3000. 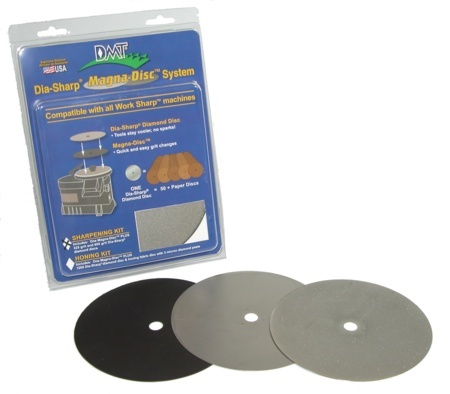 The Dia-Sharp® Magna-Disc™ Sharpening Kit comes with the pressure sensitive adhesive Magna-Disc™ , a coarse (45 micron) and a fine (25 micron) sharpening disc. The diamond discs will outlast any conventional paper abrasive discs by more than 50-to-1. Utilizing the Magna-Disc™, allows quick and easy grit changes versus messy peel and stick paper discs. Also, unlike paper discs, there is no danger of ruining the temper of tools from overheating. The Dia-Sharp® Magna-Disc™ System conducts heat away from the tool and will not generate any sparks. This is cooler and safer. For proper tool maintenance, woodworkers, chefs and other professionals rely on the superior quality and versatility of DMT® products. Made in USA. Coarse diamond disc to quickly sharpen a neglected edge; Fine diamond disc to put a keen edge on a maintained tool.